A Role Playing Game Told Entirely Through Haiku? For Christmas this year I received a few games, as did some of my friends. Naturally, we deiced to give one of them a spin during one of our (mostly) weekly get-togethers. This time we chose to play Haiku Warrior, a game created by Jason Anarchy, who has also created other party-style games, most notably Drinking Quest. Claiming to be a role playing game told entirely through haiku, does Haiku Warrior deliver, and most importantly, is it fun? The goal of Haiku Warrior is to complete six quests and gather as many souls as possible. You are doing this to stop discord from being sown into the land via an ancient spell that will awaken an extra syllable, which would obviously be disastrous in a world where everything is a haiku! Along the way you will find money, equipment, and fruit (even chicken legs, and yes, that is apparently a fruit in this game) which will aid you on your journey. To play you are going to need to gather up to three friends, or you can play by yourself (the rules are a little different, but not too much, I won’t be going over them here). You’ll need to separate the cards into the respectively labeled decks: Quests 1-6, Hats, and Boots. 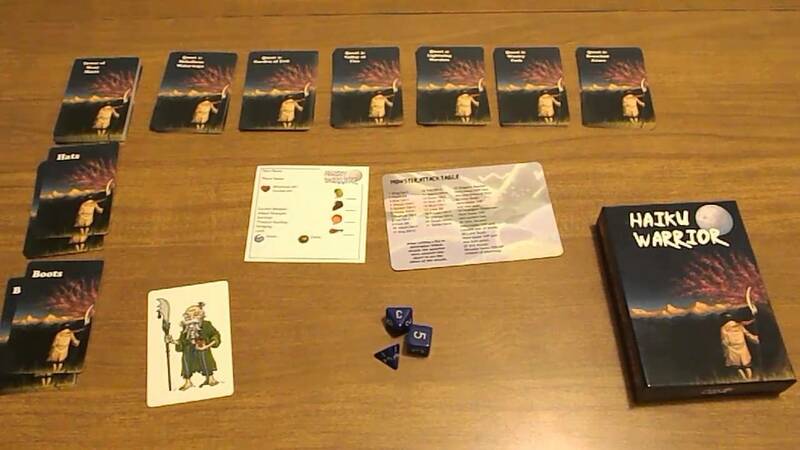 After that set aside the reference card that also acts as the shop and distribute a character card to each player. The game comes with small sheets to record all the relevant game information on, so each player should receive one of those as well or you could just use a piece of paper. Each character has a few different stats that are used for a few checks and combat. If you’ve played any table-top role playing game (TRPG) before, then this should all feel very familiar. If not, then don’t worry, it is all very simple. Compared to some TRPG’s one semi-unique aspect of this game is that you want to roll low for checks but high for combat. This may take some getting used to for some players, but it is really not that challenging to remember. In the box you’ll find a D4, D6, and D8. You’ll use one or more of these dice for nearly everything in Haiku Warrior. When fighting a monster you’ll use the die stated from whatever equipment you have and for checks you’ll roll all three dice hoping to roll under or meet your respective rating for whatever stat you’re checking against. Sometimes you’ll need a slight push to accomplish a task. Each character may spend luck points to add or subtract from any die rolls made. This is something I found myself, or any of the characters really, using much but the few times luck points were spent they were useful. For characters, it is also important to note that each one has a special ability. Some are clearly better than others but they may only be used one per quest, so the playing field is still fairly level for each player. These are a critical component of the game and should be used. Since you need to do quests to win, how exactly do you do that? On your turn you may first go shopping, but after that you draw one quest card from the respective quest deck that you are on (i.e. for quest 1 you’d draw from the quest 1 deck, for quest 2, deck 2, and so on). You’ll either have to fight a monster or make a skill check, referred to as a save in this game. Defeating monsters will grant you souls and money while succeeding a save will typically get you items or equipment. Fighting monsters is done in a fairly interesting manner by having another player act as the monster as you fight it. You make an attack against it, and if it is still alive, it then makes an attack against you. It always rolls a D4 to determine what action it takes by giving a number which is referenced from the reference card. This keeps the gameplay varied while adding an element of mystery since you’ll likely not have each number memorized. Upon defeat you get the stated gold and souls from the creature and your turn will end. You may fail during your journey and die, but don’t worry! The game is actually fairly forgiving and you are never permanently removed from the game. Instead, if you have a healing item you may eat it to instantly keep going or spend 2 souls to do the same. However, if you can’t do either, you must end your turn and completely start over from quest one with the starting equipment/stats for your character. The big thing Haiku Warrior promises its players is that this is a role playing game that tells its story entirely through haiku. While I would not call this a role playing game at all, it just doesn’t encourage the right atmosphere or play for that, it does come through on the haiku side of things. Each card has a printed haiku that the player reads and that’s pretty fun. Some are just plain bad, but most were decent. In terms of positives aspects, the game is fairly quick, playing in an hour or less depending on your player count, and the rules are very simple. This is a game you could literally open blind, skim the rules, and be playing correctly in a matter of minutes. Dice are a nice vibrant color and are easy to read, with the exception of the D4 which puts the rolled number on the bottom vs the top, but that is merely personal preference and not really a mark against the game itself. Unfortunately, there are a fair number of flaws with the game itself that may prevent most people from playing it more than once or twice. While some of the complaints here are partially personal taste, most of them are more systemic issues with the game’s actual design. The first problem is the game just ins’t balanced well. Some characters are clearly stronger than others, equipment hardly seems to matter, and quest 1 cards can be harder than quest 6 cards. It never feels outright unfair but it also doesn’t feel great to be stuck on quest one while everybody else is on quest 4. When it comes to equipment, I don’t have any idea why you would ever spend gold on it. Just buy healing items. Your characters are squishy and you’ll likely die and have to restart, or at least loose several souls, if you don’t. Who cares if you do 1D6 of damage versus 1D8 if you are dead? Most people tried getting better gear but I had a very easy time playing with just starting stuff and finding hats/boots from quests. I only bought fruit to heal with, and as a result, never once died (I’d heal before questing). This also leads me to talking about the hats and boots. Some hats are bonkers while others are totally worthless. Same goes for boots. Since these are items you find in place of fighting a monster, which you gives you victory points and money, this can feel pretty bad. If you already have a high treasure hunting stat, that hat that lets you raise your stat by 1 doesn’t do anything for you. Not only that, but you may have only one hat and set of boots at any time, so once you have a good one, those events literally become worthless. Since you don’t get gold or souls from events requiring you to make saves, they can really put you at a disadvantage. In our game I fought hardly any monsters. I still won because I never had to spend souls to revive, but most of the game was me just sitting there doing nothing. The few times I did fight, I just used my player ability to make a previously defeated monster attack in my stead. It felt far too passive despite how active Haiku Warrior is supposed to be. A more minor issue is the art. The box is stunning but the game art on the cards is lack luster, and kind of lazy in some cases. It really pulls you out of any semblance of immersion you could have, and for a, “role playing” game, that is not good at all. The card quality is alright, but each of the cards have the same back (which does look good), but outside of the text, there isn’t an at-a-glance way to distinguish the several decks from each other in the event the cards ever get mixed up. Lastly, and my biggest complaint, is the game lacks diversity. Monsters don’t feel distinct from each other, there are like 3 events that don’t really change at all, and worst of all, they don’t even scale in difficulty. There isn’t a sense that you are actually accomplishing anything. It feels good when you succeed a roll and beat the odds, but that can only carry a game so far. Apparently this game is boxed with an expansion but I legitimately couldn’t tell. This seems to be a cooperative version of the game where you try and fight lots of monsters without losing. Might be good but since I haven’t tried it I can’t offer much in the way of thoughts on that. In a lot of ways this game feels like Munchkin but with much less variety. Haiku Warrior is faster and easier to learn, for a lot of folks Munchkin is just going to be the better game. A lot of people really dislike that game though, and in that way, this may be a suitable alternative because the theme is interesting at the very least. Despite how harsh I’ve been towards Haiku Warrior, I did enjoy the game. It’s light and fast, just on the edge of outstaying its welcome, but sometimes that’s enough. While I wouldn’t want to play this regularly, on a night where folks still want to roll some dice and beat some baddies but mostly just chat and have a nice time, this will satisfy. If you received this game as a gift, or could pick it up on sale/for a cheap price, you wouldn’t feel like you got a bad deal. You can purchase the game on Amazon for about $20 bucks. Some brick and mortar stores may sell Haiku Warrior in your area as well, but it will probably be more expensive in that case. 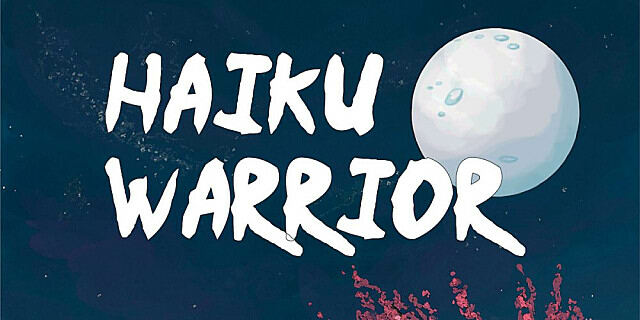 Have you played Haiku Warrior? What are your thoughts on the game? Will you be trying this out if you haven’t played before? Let me know your thoughts in the comments! Want to support my content? You can help me out by clicking on my donation button below, I’d really appreciate it. As always, thanks for taking the time out of your day to read and I hope to see you back here at Jon Spencer Reviews again soon! Definitely an interesting premise. As someone who enjoys card games, I might check it out even if it only sounds meh.